The PA3 and PA3S power amplifiers can be upgraded with new capacitors. The upgrade includes replacement of the main reservoir capacitors with new Slit Foil capacitors (PA3) and new Supertech 4TTN capacitors (PA3S). Both amplifiers will also be fitted with newly designed ultra-long-life local decoupling capacitors to improve performance and greatly extend the life of the amplifier. This upgrade needs to be carried out at DNM Design. There are several possible shipping methods from different parts of the world and some owners will not have the DNM packaging needed for safe shipping. d.morecroft @ dnm.co.uk to receive an inclusive quote for all aspects of this upgrade. For a quicker quote if using email, please include your postal address and let us know whether you still have the DNM packaging for your DNM power amplifier. is a major departure from a conventional power amp design. A direct replacement for the classic DNM PA1, the PA3 tackles important new design issues that relate to sonic differences between the famous categories of power amplifiers-Valve, Transistor, Single Ended, Push-Pull, Bipolar, FET. DNM worked hard to understand and control these new design parameters because the potential rewards are great, for example-- a class AB transistor design that can outperform a single ended triode or a class A transistor amplifier. This new DNM power amplifier design gives more power, higher sound quality, cooler running with increased reliability and much longer operating life--all important factors for customers who want the best sound and practical hi-fi at home. To achieve this the PA3 uses an all-new three-dimensional circuit with ultra-tight control of its feedback surrounded by new magnetically neutral materials technology to improve dynamics and reduce the sonic signature of the amplifier's structure. This is a significant advance on conventional amplifier designs, which use flat printed circuit boards with circuits that must be tortuously routed in two-dimensions, that ignore the adverse effects of circuit generated magnetic fields and their reaction with the metal in the structure. Mains power is supplied by a separate Primus-sized power supply box, which contains the mains transformer, fuses and switches, keeping the sound-damaging AC mains effects away from the signal circuitry. The DNM three-dimensional design is identified by the symbol - this represents the "impossible" triangle which is an optical illusion used to show how vision is deceived by a trick of perspective. Three dimensional construction is arranged in layers and it allows the amplifier to run power supply and ground tracks vertically through the structure of the amplifier eliminating (by orthogonal means) any magnetic interaction with the main circuits. The new construction also allows for more precise, repeatable circuit layouts and shorter circuit tracks that improve high frequency performance which, combined with precise control of the feedback circuits reduces the sonic signature of the design. . 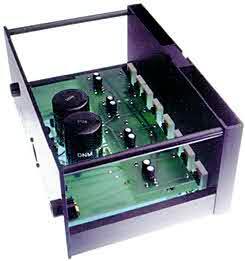 In short the DNM PA3 sounds more like the original signal and not like a circuit in a metal box! Each level of the circuit board is designed to work in its optimal setting. For example, the central level of the amplifier houses all the sensitive reference circuits which are placed near the grounding to minimise interference. State-of-the-art surface mount devices are used to define all the time-critical settings. The top layer houses the power distribution board which feeds all the amplifier circuits. This board places the metal-bodied decoupling capacitors well away from magnetic fields in other circuits. The PA3 amplifier is a very high performance, high resolution design with the typical strengths of all DNM amplifiers, but its power rating allows it to be used with a wide variety of quality loudspeaker systems in domestic settings. Considered by many in the audio industry to be one of the finest solid-state power amplifiers ever made, the regulated PA3 S is the first design in the world to use the revolutionary new T-Network capacitor designed by DNM's Denis Morecroft. The PA3 S uses multiple power supply control to emulate battery operation -- a form of AC regulation and a unique DC regulator system to feed ultra-smooth, ripple free power to the amplifier circuits. It also utilises the same three-dimensional board layouts used in the PA3 to control the magnetic performance of the circuits. A considerable amount of research and development time was spent in ensuring that the full potential was gained from the use of DC regulated power supplies. The PA3 S, with its lower power rating of 23 watts per channel, is intended for use with more efficient loudspeakers (90dB/Watt with 4-8 Ohm load) in a domestic environment. In such a system, it can deliver unsurpassed levels of resolution, scale and power in the music. The PA3 S achieves a sense of power and scale through sheer resolution and timing accuracy. Finally, an aspect of sonic performance rarely discussed but so critical to many customers, is that of high quality sound at low listening levels. Such levels require limited power but often sound 'flat' and unsatisfying to the ear. As the DNM PA3 Series primarily relies on resolution to create the sense of scale and power, listening enjoyment is retained whatever your chosen replay level. Technical specifications are here.